The Form of Government (FG) of the Orthodox Presbyterian Church requires seminary training for men who would be licensed or ordained to preach. 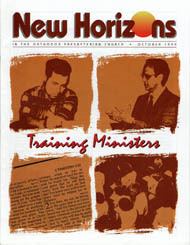 In recent months, the "ShepherdFinder Update" on the Home Missions pages of New Horizons has focused attention on the pressing need for pastors in the Orthodox Presbyterian Church, both for mission works and for organized congregations. We have been reminded of our duty to pray, for the laborers are few. In prayer, we acknowledge that God alone can raise up true pastors for the work. A biblical pastor is a man who has been called by God. "Then the master said to the servant, 'Go out into the highways and hedges, and compel them to come in, that my house may be filled'" (Luke 14:23 NKJV).